Alternative medicines and treatments are getting more popular not just for people, but also for animals. Some of these methods include homeopathy, massage, herbology, chiropractic treatments, and acupuncture. Acupuncture has been used in traditional Chinese medicine for more than 3,000 years and involves the use of very thin needles being inserted into various points in the body. It's believed that acupuncture stimulates healing processes in the body and thus, allows the body to heal itself. The treatment has been used for both prevention and the treatment of diseases. In the case of animals, the person who performs the process is the veterinary acupuncturist. Here's a look at the duties, career options, educational requirements, salary and job outlook of the veterinary acupuncturist. Veterinary acupuncturists insert small needles into various pressure points on an animal’s body. The insertion of the needles into these pressure points causes various natural chemicals such as endorphins to be released in the body. Acupuncturists may also connect tiny electrodes to the acupuncture needles after insertion, using a mild electrical current to stimulate the various muscle groups and nerves. Veterinary acupuncture can be used to treat a wide array of conditions such as arthritis, neurologic disorders, reproductive disorders, gastrointestinal disorders, paralysis and muscle injuries. It is also frequently used as a maintenance procedure for healthy, athletic animals used in performance competition events. Many Thoroughbred racehorses, for example, receive regular visits from their veterinarian for acupuncture treatment. Many canine breeds suffer from hip dysplasia and other degenerative joint-related conditions — especially as they get older. 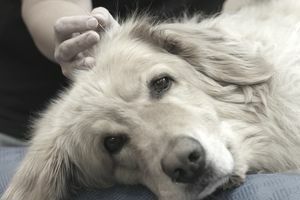 While many traditional medicines may temper the symptoms, the American Academy of Veterinary Acupuncture says acupuncture can be fairly effective when treating dogs with these debilitating conditions. Veterinary acupuncturists develop and implement treatment plans based on the individual animal’s needs. The acupuncturist must determine the frequency of treatment as well as the anatomical points that must be stimulated to correct the problem. Most treatment plans for acute problems involve more frequent treatments in the initial stages and taper off over a period of a few weeks. Veterinary acupuncturists may also design special nutritional and behavioral modification programs to work in conjunction with the acupuncture regimen. The acupuncturist must be able to communicate the treatment regimen to the pet owner effectively. They must be able to assure them that acupuncture is not a guarantee, but an alternative to traditional medication. Veterinary acupuncturists may specialize by species, with equine and canine treatment being the most popular. Some acupuncturists may also specialize in treating avian or exotic species. Acupuncturists may practice in veterinary clinics, kennels or zoos. Large animal acupuncturists tend to travel to provide services to their clients, while small animal acupuncturists tend to see patients in an office setting. Some acupuncturists choose to branch out, offering additional alternative treatment options, such as herbal therapy or massage therapy. To become an accredited veterinary acupuncturist, the practitioner must be a licensed veterinarian who has completed extensive, additional training related to muscle physiology, anatomy and acupuncture techniques. Founded in 1974, the International Veterinary Acupuncture Society (IVAS) has offered the most prominent international acupuncture certification path. The IVAS, which has more than 1,800 members worldwide, certifies licensed veterinarians and fourth-year veterinary students to practice on large animals, small animals, avian species and exotic species. The IVAS certification course is comprised of both educational lectures and practical hands-on training. Most American veterinary acupuncturists also choose to join the American Academy of Veterinary Acupuncture (AAVA), the U.S.-based affiliate of the IVAS which was founded in 1998. This group focuses on offering additional continuing educational opportunities and information for U.S.-based veterinary acupuncturists. It is important to note most states only allow acupuncture to be practiced by a licensed veterinarian as it is classified as a surgical procedure. An aspiring acupuncturist is unlikely to enter the profession without first obtaining a veterinary degree. It would be wise to check with veterinary boards and departments of health for specific requirements. The salary a veterinary acupuncturist earns can vary based on factors such as the number of patients treated, job location, years of experience, level of education in the field and whether the vet has partner or associate status in their practice. With significant experience and skill, the veterinary acupuncturist can earn top dollar for their services. When calculating their yearly salary, a veterinary acupuncturist must take into account additional expenditures such as the purchase of medical equipment and travel expenses for making home and farm visits to work on their clients. Most experienced veterinarians earn a salary in excess of $80,000 per year. Board certified specialists can earn salaries well over $150,000. According to the U.S. Bureau of Labor and Statistics (BLS), the average annual salary for any veterinarian in 2017 was $90,420. The highest 10% of vets earned more than $159,320, while the lowest 10% earned less than $53,980. The agency does not differentiate between standard veterinary practices and those who offer specialties. While veterinary acupuncture is not recognized by the American Veterinary Medical Association as an individual specialty category at this time, many board certified vets have completed the additional training in acupuncture and use it as a part of their practice. The BLS projects careers in the veterinary field will continue to grow at a slightly faster than average rate — roughly 19% between 2016 and 2026. This is because of the rise in consumer spending for animal wellbeing and healthcare, as well as the advances in veterinary technology. The interest in alternative therapies for animals also seems to be growing steadily. Veterinary acupuncture is expected to grow in popularity as it gains recognition in the medical community and continues to prove beneficial in treating various physical problems. According to the American Veterinary Medical Association, the average salary of a veterinarian increases by nearly six percent each year, outpacing the rate of inflation and cost of living increases. Veterinary acupuncture is part of the very stable veterinary profession that has an excellent outlook for the future. What Is a Veterinary Microbiologist? What Is a Veterinary Anesthesiologist? What Is a Veterinary Theriogenologist?